Coming of age and self discovery dramas are a dime a dozen but once in a while an interesting new take on the theme comes barrelling through the noise. Andrew Huculiak's Violent is exactly one of those movies but rather than powering through by force, Huculiak's feature film debut purposefully strides across the room and quietly commands everyone's attention. It's an impossible film to ignore or forget. Relative newcomer Dagny Backer Johnsen stars as Dagne, a young woman who wants to escape small town life. Her mother makes arrangements for her to move to the city to work at a family friend's store, a job that comes with a place to live around the corner from the shop. It's a barren little apartment but Dagne seems genuinely happy with her meagre surroundings and less that glamorous job. While most teens would scoff at her situation, Dagny she's thrilled to be in the big city, seeing old friends and making new one. What sets Huculiak's movie apart from other coming of age stories is how normal it all feels. There aren't any huge parties where Dagny gets in trouble, she doesn't go around sleeping with every boy she meets or leaving destruction in her wake around the city. She's just a girl, hanging out with friends and making the best of her circumstances. But Huculiak marks Dagne's day to day normalcy with gorgeous, if sometimes baffling images. Some are abstract and look like static while others are simply strange, people and furniture floating above the city. They don't make much sense but they're beautiful and they make for an interesting transition from one emotional moment in Dagne's life to another. The thing about Violent is that by the end, it feels like a completely different movie than it did at the beginning. The sum of the parts all tell one story but as that story develops and the scenes build on each other, the story also takes on new meaning and what didn't seem to make sense at the beginning is suddenly clear. What's fascinating is that Huculiak doesn't hide anything from the audience. The clues are there and in hindsight, fairly obvious. Some may be observant enough to see what they're building to but I found myself so drawn into each moment that I felt completely blindsided by the ending. Shot by Huculiak's frequent collaborator, and co-writer on the film, Joseph Schweers, and accompanied by music from We Are the City's album of the same name, Violent is one of those rare debuts that introduces a filmmaker that has a fully formed vision and the skills to realize it. 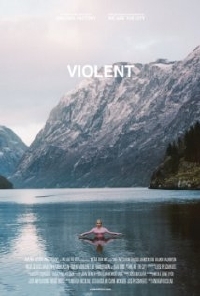 Violent is unlike any other coming of age story I've seen and its unlikely I'll ever see another one quite this profound, a movie that works as both a story of self discovery and of self reflection at the same time. A fantastic achievement that is not to be missed.